In the late 1980s and 1990s, the advanced industrial countries considered replacing the existing analogue television infrastructure with a new digital one. A key common feature to the debates over digital TV (DTV) in the United States, Western Europe and Japan was the eventual victory of the ideas of digitalism (the superiority of everything digital over everything analogue) and of digital convergence (the merging of computing, telecommunications and broadcasting infrastructures made possible by digitalization) in public debates over standards. 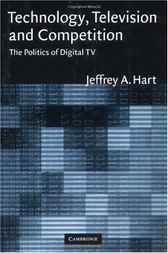 Jeffrey Hart's book shows how nationalism and regionalism combined with digitalism to produce three different and incompatible DTV standards in the three regions, an outcome which has led to missed opportunities in developing the new technologies. Hart's book contributes to our understanding of relations between business and government, and of competition between the world's great economic powers.